Ready or not … here comes Christmas! 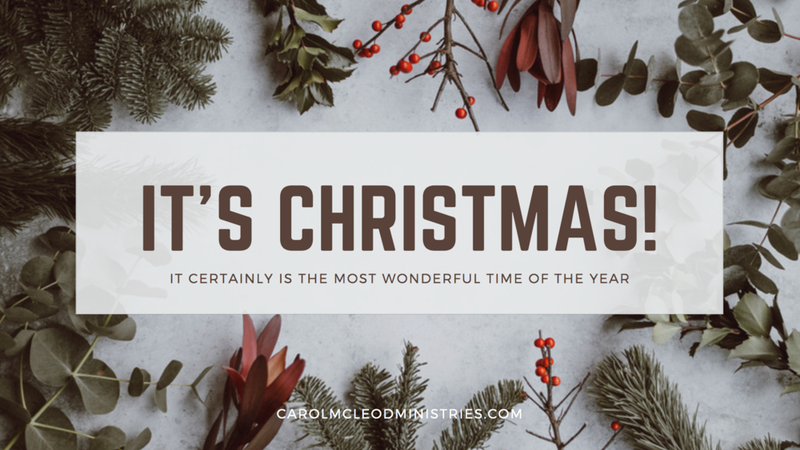 This is the time of year that instigates feelings of celebration, of goodwill toward men and of the joy that is unique only to this miraculous season. Well … for some of us it accomplishes all of the above! These uncommon and jolly folks actually endure the other 11 months in order just to arrive at December the first. For others, however, the 4 weeks that constitute the month of December usher in a 31-days commitment to stress that raises one’s blood pressure … a sinking realization that the life that you are currently living is definitely not reminiscent of a Rockwellian picture … and a dread that overpowers any other lilting magic of the season. If I have just described your volatile relationship with December – you have come to the right place! I can help you with your anxiety and disdain concerning all things Christmas. Although I don’t believe that it is necessary to gain 10 pounds during this month … or to stand in unending lines that devastate your schedule … or to raise your indebtedness by a 4-figure number … I do emphatically believe that Christmas is worth celebrating. And, if one dose of healthy and miraculous Christmas every 7 days is not enough for you – you can click here to buy a copy of the devotional in order to read it every day during this sparkling, eternal and generous month! “It’s Christmas! It certainly is the most wonderful time of the year! It certainly is the most wonderful time of the year! This season is miraculously wonderful not because of the scrumptious and sugary holiday cookies nor is it due to the lavish gifts found under the Christmas tree. Christmas is not defined by the reindeer who dance or by the shoppers who spend. Christmas is not “Christmas” because of decorations, or parties or even by the chestnuts that you might find roasting by an open fire. 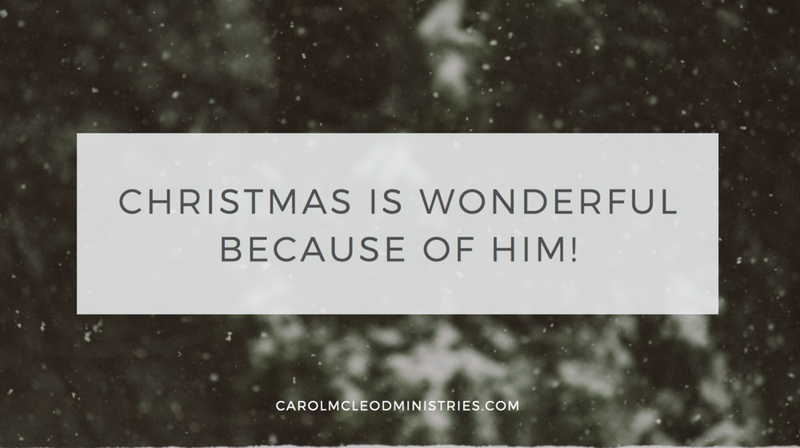 Christmas is wonderful because of Him… because of a Baby that was born long ago and yet continues to live on in the hearts and lives of millions of believers across the scope of history whose lives have been revolutionized by the joy of His presence. The historical account of the birth of Jesus didn’t commence in Bethlehem or even in Nazareth but it began with an elderly couple who knew the deep fulfillment of living wholeheartedly for God. Elizabeth and Zachariashad been married for many years and yet still had no babies. The heartache must have been wrenching for this man of prayer and his wife, but the Bible records they continued to walk blamelessly in every aspect of their relationship to the Lord. For the priest Zacharias and for his faithful wife, Elizabeth, there had been no 3 a.m. feedings, no messy diapers and no sweet giggles and baby smiles. Their life had not turned out in the manner that they had hoped for or prayed for. Disappointment is part of all of our lives, isn’t it? Disappointment is surely part of the human experience. How do you respond to disappointment? Do you use it as an excuse for over-indulgence or for griping and complaining? Although Elizabeth and Zacharias had empty arms and dashed hopes, they continued to serve God wholeheartedly as the years continued to pass. The Bible says that the prayer of the righteous one avails much! (James 5:16) When you continue to live a righteous life and continue to pray in spite of your human disappointment, your prayers will still get the job done! The Bible also says that the righteous live by faith. (Hebrews 2:4) Elizabeth and Zacharias continued to walk by faith and not by sight. Elizabeth’s name actually means “God is my Oath”. Elizabeth believed the promises of God long after others would have given up in frustration. She believed that God was listening to her prayers while her friends cooed over their own babies and then decades later when her circle of friends experienced the joy of rocking their grandchildren to sleep. I hope that the first lesson you will learn in the Christmas story is to be patient with God. Trust God even when your circumstances are challenging and continue to live a righteous life through long days of disappointment. Pray fervently and believe that God is listening to your prayers. Allow the steadfastness of Elizabeth to remind you that true believers walk by faith and not by sight. Although she was barren, she continued to believe in the promises and in the nature of a faithful and miracle-working God. Zacharias was chosen to be the priest this specific year who would enter the holy place in the Temple. It was his turn to offer incense to God on behalf of the people. However, as Zacharias was standing beside the altar of incense, he received a surprise visitor! The angel Gabriel had been sent from heaven to bring a life-changing message to the elderly Zacharias and Elizabeth. “Do not be afraid, Zacharias, for your petition has been heard,”were the words of the heavenly messenger at this history-changing moment. After all of the years of waiting and praying and believing, heaven’s intervention was about to be experienced in the life and marriage of Elizabeth and Zacharias. Could it be true? Was it even possible after decades of marriage that they would conceive and bear a son? Would Elizabeth’s elderly frame be able to withstand 9 months of pregnancy and then the pain of giving birth? It is true: God absolutely hears your prayers. Don’t give up, my friend, don’t ever give up! The message of Christmas speaks into our silent world today: we serve a God Who answers the prayers of His children. While you wait, and while you pray, don’t ever give up! Wait in faith and pray in hopeful expectation. For what have you been praying? Perhaps you are praying for an unsaved spouse or for a rebellious child. Maybe your fervent prayer is for a breakthrough in finances or it might be that health concerns have dominated your prayers for years and years. You need to follow the example of Elizabeth and Zacharias and continue to pray with expectation and with hope! Christmas is a time that reminds us that miracles really do happen, that prayers are actually answered and that heaven is just one response away. You honor God when you ask of Him the impossible!